iPECS SBG-1000 is a truly converged communications platform tailored for small businesses and SOHO integrating IP telephony, data networking, wireless, security and IT needs in a single unit. iPECS SBG-1000 is optimised to deliver small businesses with limited budgets and resources the advanced communications capabilities of the larger enterprise yielding smart business outcomes. 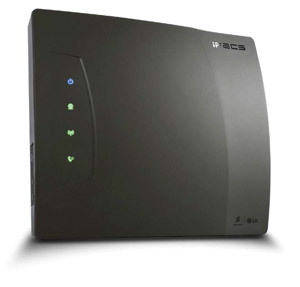 iPECS SBG-1000 is a next generation smart platform for multiple communications services, designed to easily integrate with service providers’ advanced managed services such as high speed broadband access, and value added services while minimizing the installation and maintenance effort. iPECS SBG-1000 is the right answer to today’s converged communications needs and, with its high-performance IP based platform, is ready to integrate with future IP applications and technologies.